Then students, PE guys, Charles Stretch and James Pearce founded SMSPortal in 2002 with R20,000. Now it is an international business, with a R300m turnover and are gracing the front cover of Entrepreneur magazine. Pick up this months edition to find out how they made it. Submitted by: Kimberley Nanson on behalf of SMSPortal. 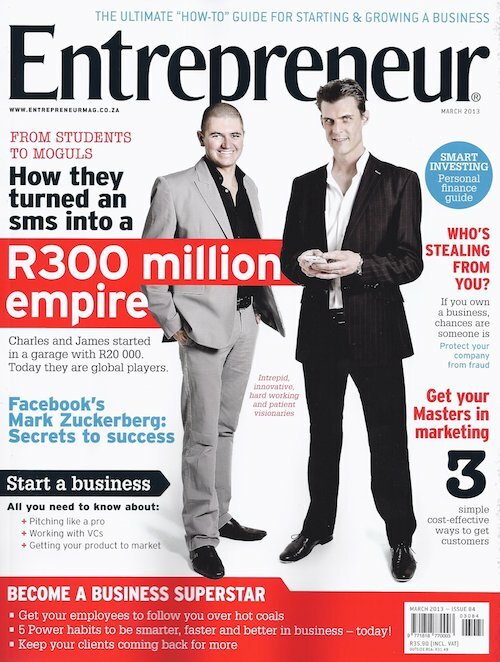 March’s front cover of Entrepreneur featuring SMSPortal’s Charles Stretch and James Pearce. Next: Could BEE be Discriminatory towards Black Males?